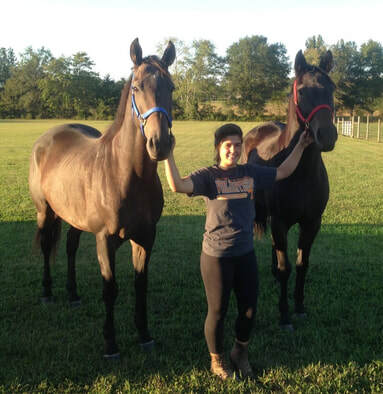 #ThoroughBredThursday Lady found a new home! The Horse Rescue was founded on a mission to save Thoroughbreds from slaughter, rehab them from any injuries racing may have brought, and retrain them for second careers. Lady came to us with severe bowed tendon. Bowed tendons are very common among racehorses. Tendons in the forelimbs are much like rubber bands. Sometimes, when the forelimb is fully extended during a sprint, the tendon is stretched just like stretching a rubber band. When the tendon stretches too much, it does not go back to its original resting state. Little tears are created in the fibers of the tendon, thus resulting in a bow... an over stretched rubber band that will not go back to its original form. "Lady" had a unique bow where she had injured it as a 2 year old and then injured it again as a 4 year old. If a bowed tendon is properly managed, she should not of had this issue. When Lady came into our program, we immediately started work on her tendon. We shockwaved it twice, one month apart each time. We administered laser therapy 3 times a week for over 30 days. Finally, we kept her leg wrapped at night and during the day. Keeping compression on the leg is key to repair. After 45 days, we knew the tendon was solid enough to start tack walking. We put her up for adoption and a couple weeks later, she found the perfect home. With a tendon as injured as hers, she will never be able to do heavy work, but light walk, trot, canter and the occasional jump will be perfectly fine. We wish Lady and her new owner, Hannah, the best of luck. Meet Equo Driver Robert Cyrek!